The send log shows the actual delivery status of your jobs. The delivery status might change within 24 hours. The operator confirms the reception of the message. You can consider the message delivered. The message could not be delivered. 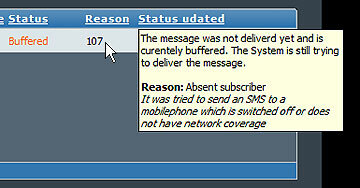 Possible reasons: unknown subscriber, call barred, target device is not able to receive sms, wrong number format, etc. The message was transferred to the operator of the recipient but could not yet be delivered. At the moment, further delivery attempts are pending. Possible reasons: absent subscriber, device out of memory, temporary technical issue within the network of terminating operator, etc. 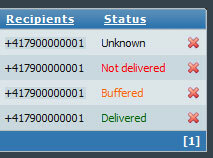 The delivery status "buffered" changes within 24 hours to the final delivery status "Delivered" or "Not delivered". Delivered: The operator confirms the reception of the message. You can consider the message delivered. Not delivered: The terminating operator has given up to deliver the message after 24 hours. Deferred delivery time: Delivery is in the future. Delivery notifications delayed: Due to a big broadcast, delivery notifications are delayed but will arrive later. e.g. at New Years Eve. Hint: Click a message in the send log to get to the job details. Move your mouse over the reason code (e.g. 107) for details.